The iPad Pro is real, and it's faster than anything we've seen in an iOS device before. In fact, Apple claims, it's faster than 90% of PCs out there. Revealed at Apple's event in San Francisco, the iPad Pro has a 12.9in screen that offers 78% more area than the original iPad and 360 times more graphics-pumping power behind it. There's a large number of pixels in that screen too, 5.6 million - more than in the screen of a 15in MacBook Pro with Retina screen - taking the custom timing controller from the recent 5K iMac to handle it all. 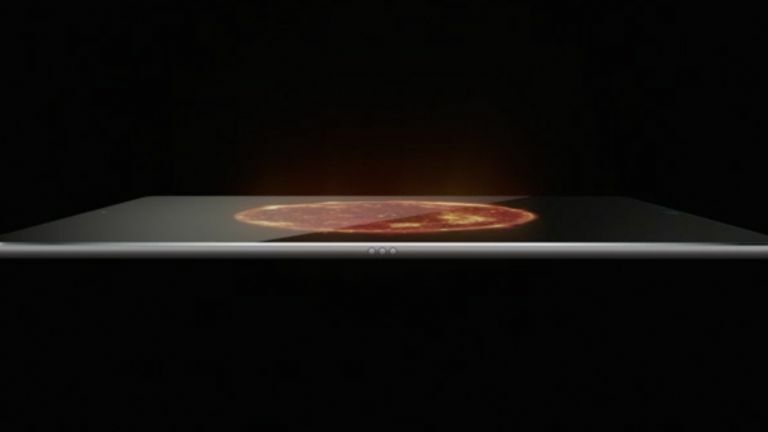 The width of the new screen is the same as the height of the current generation iPad Air 2, something described as 'like having two screens' by Adobe's Eric Snowden, the Photoshop maker's lead product designer, as he demonstrated artistic and layout tools on the new device along with multitasking. Inside the iPad Pro there's a new A9X CPU that's 1.8 times faster than the A8X chip seen in the iPad Air 2 and delivers twice the memory bandwidth. Editing three video streams simultaneously in iOS iMovie was held up as an example of its abilities by Apple's senior vice president of worldwide marketing Phil Schiller. Despite being only a tiny bit thicker than the Air 2, the extra screen area means there's space for a larger battery, leading to a claimed ten-hour battery life - enough to keep you going all day. Four speakers supply the audio, in a configuration that can automatically adjust to the way the iPad is held. New accessories announced to work with the Pro were the Smart Keyboard, which connects through a brand new interface that transfers power and data through a magnetic link. The Apple Pencil was also shown, a pressure-sensitive stylus that communicates position and angle data to the iPad Pro for artists to simulate a range of creative media. Schiller was keen to press the environmental credentials of the new device, underlining its mercury-free manufacturing and ease of recycling. iPad Pro will be on sale in November, with prices starting at $799 for the 32gb model.